The GOLD PRICE today fell back from $1,080 like Vlad Dracula reeling back from a crucifix, down $7.10 to 1,074.80. Tacky and tasteless, but still above the 20 DMA (1,067.69). Silver rose — hold onto your seat — one-tenth of one cent to $14.302. Interesting — The SILVER PRICE is backwardated. The spot month contract, December, closed today at 1430.2. January 16 closed $14.286, and February 16 at $14.30. That’s not a huge backawardation, but still means something. Physical silver for immediate delivery is selling at a premium to futures silver. Normally the more distant months carry a higher price, due to the costs of carrying the silver until the contract comes due (interest, storage, insurance). When the spot month rises above the futures months, the market wants silver in hand bad enough to pay more for it than futures. Not significant yet, but could become so. Today changes nothing that I said yesterday about the silver and GOLD PRICE bullish outlook, it only points out the ambiguity and torment of reversing. That GOLD/SILVER RATIO keeps on dropping, and stands below its 20 DMA but barely above its 50. Closing 75.04 at the end of day, it stands not far above the 200 DMA at 74.20. You can’t expect much to happen the week before Christmas, when traders are closing out positions to enjoy a holiday not worried about markets. Santa Claus has not arrived yet on Wall Street, but stock investors got a little gift today. Dow rose 165.65 (0.96%) to 17,417.27 while the S&P500 added 17.82 (0.88%) to 2,038.97. Since both continue below their 200 day moving averages, trying to breath underwater, as it were, this ain’t too impressive. It did affect the Dow in Gold and Dow in silver, since metals today fell or were flat, so higher stocks brought up the Dow in Gold and Dow in Silver, but not much. Dow in silver rose 0.47% to 1,216.80 troy ounces, bouncing off the uptrend line from August 2013 and the nearby 50 DMA (1,197.82). Dow in Gold bounced off an old resistance/support line, also near the 50 DMA (15.97 tr. Oz). Both indicators have made a series of lower highs and lower lows, i.e., a downtrend. 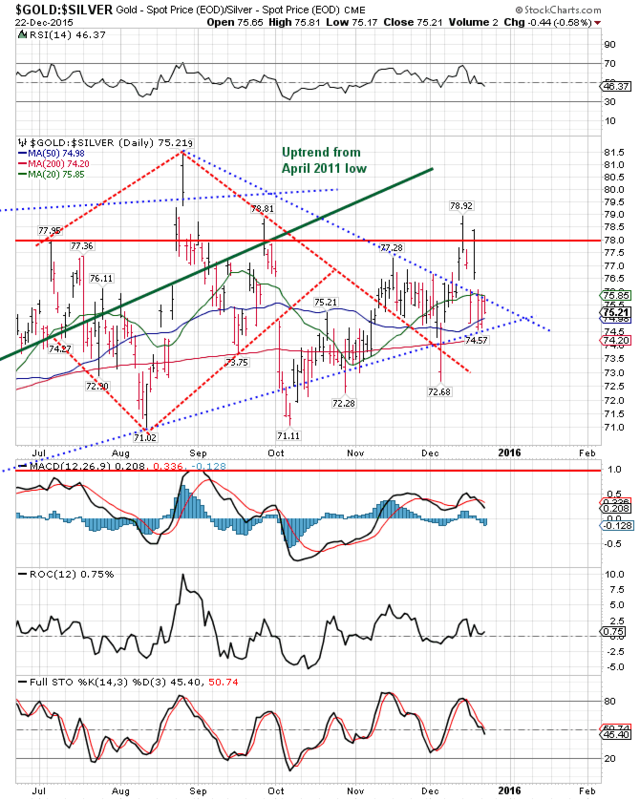 Scrofulous US dollar index continues to pile up evidence it is broken. Today it sank another 23 basis points (0.23%), touched the 50 DMA (97.98), and ended at 98.23. Just goes to show the Fed and FOMC can goose markets, but they can’t make ’em stay goosed. Euro rose 0.35% to $1.0953, doing nothing but at least again in the range it fell out of in November. Ditto the Yen, up 0.11% today to 82.61.